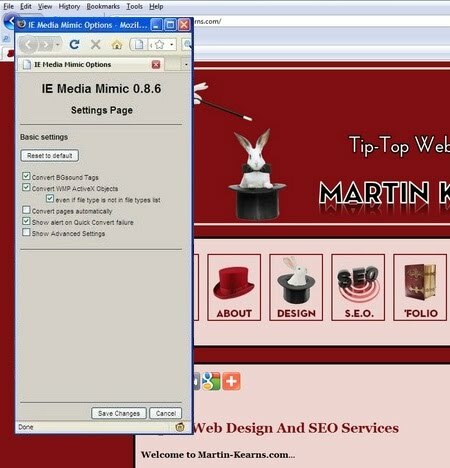 Disclaimer: When I first wrote this article in early June 2009, both Greasemonkey and IE Media Mimic could both be successfully applied to what was then the current Firefox Browser (Firefox 3.0). 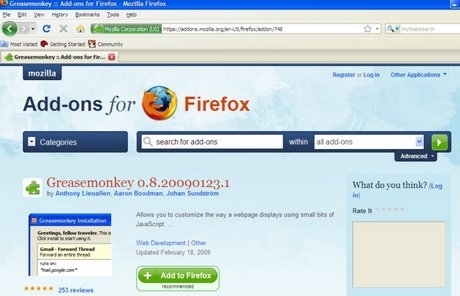 I cannot guarantee that this fix will work effectively on versions of Firefox 3.5 (released June 30, 2009), Firefox 3.6 (released January 21, 2010), Firefox 4 (released 22 March, 2011) Firefox 5 (released 21 June 2011), Firefox 6.01 (released 30th August 2011) - or any of the numerous Firefox versions since then (I think we're up to Firefox 94 22.0 as I write this). If you want even a halfway guarantee that Greasemonkey is going to cuddle up to your Firefox browser effectively, my recommendation is that you revert (if need be) to Firefox 3.0 - (link opens in a new window). Firefox is one of the lovelier browsers out there. Sleeker, slimmer, better looking and way more versatile than Internet Explorer, it has an endearing tendency to load pages much more rapidly than its ugly cousin, while managing not to crash every two minutes. If you don't have Firefox installed on your computer, shame on you. Get it here, right now, then come back. That last link will take you to a place where you can download the "old-fangled" (ha!) Firefox 3 - see the blurb above). Got it? Onwards, and upwards we go. One drawback to Firefox - (one of two*) - is that sometimes it simply will not render sound or video files embedded within webpages as smoothly or as effectively as Internet Exploder does. 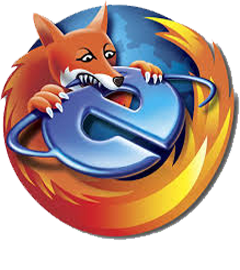 This issue is easily remedied though; here, you will learn that it is possible to enjoy the speed of Firefox, while, at the same time forcing it to mimic that one aspect which Internet Explorer does do better. It is surprisingly easy, too. 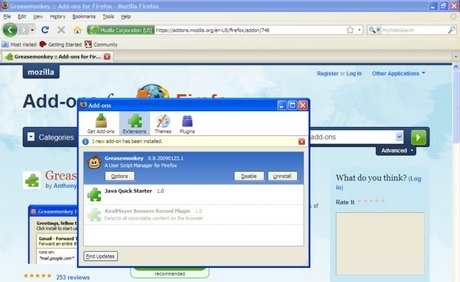 First, you will need to install an add-on (also called a plug-in) for the Firefox browser. 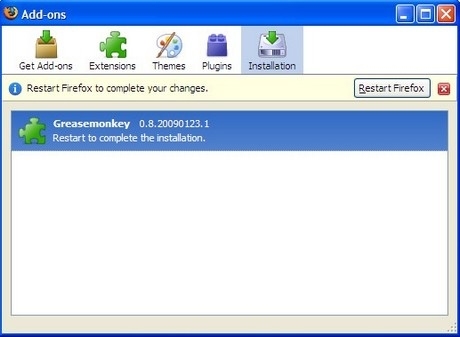 This add-on is called Greasemonkey, and can be downloaded via the page you will find at this link (opens in a new window). Please, when you go to this page - make sure that you are doing so in the Firefox browser! 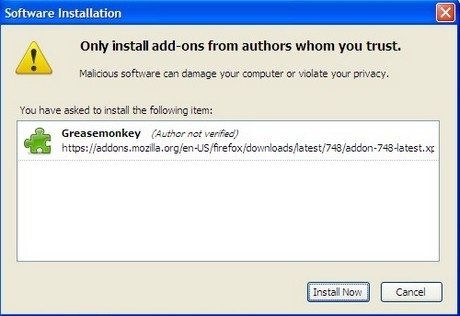 (If you do try this using Internet Explorer, then the resulting download will be an unusable file called greasemonkey-0.8.20090123.1-fx.xpi - or similar - which will do no more than litter your hard drive). See the green button on that page? It should state "Add to Firefox". 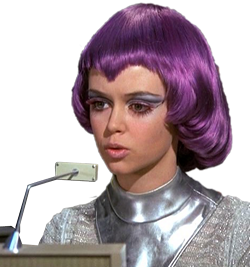 That will confirm that you have landed on the page while using the appropriate browser. If that green button says anything but that - something like "Download Now" - then you are likely not using Firefox, and this will fall at the first hurdle. ...And here they are. Firefox, this is Greasemonkey. 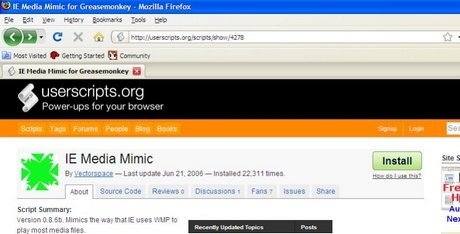 Greasemonkey, this is Firefox. Like that small add-ons window says, "1 new add-on has been installed". Now at this stage, you can either click on the red X to immediately close this small add ons window, or if you are pernickety, first select the "Find Updates" button situated at the lower left corner of it. Either way, click on the red X to close this add-ons window. You will now find two (not immediately obvious) changes in Firefox: The first change is entirely cosmetic (but oh so cute! ); your very own pet (grease)monkey sitting just above your computer clock - like so. Aw. Notwithstanding this new option within the Tools menu, there is nothing yet that you can do with it. Note in particular that the "User Script Commands" option is greyed out. 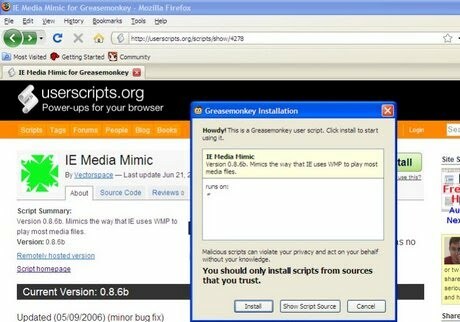 Greasemonkey relies upon the installation of scripts, and without them, it does nothing of any consequence at all. Now, there are numerous scripts available for Greasemonkey, and many of them are highly useful - but all of them, bar one, fall outside the scope of this tutorial. The one script that you do need to install is called Internet Explorer Media Mimic (or IE Media Mimic for short), and can be found here (opens in a new window). Again, it is important that you do this while viewing the page in your Firefox browser, and not in Internet Explorer. Click on the pale green "Install" button, Firefox will then display a Greasemonkey branded installation box. Click on the Install option in this box. Again, the download is quite small, and rapid. Once the installation has completed, either restart Firefox, or as a minimum, clean refresh the page (Control+F5). Then, from the browser bar, click on Tools, and mouse over to "Greasemonkey". The submenu will display and the "User Script Commands" option will no longer be greyed out. 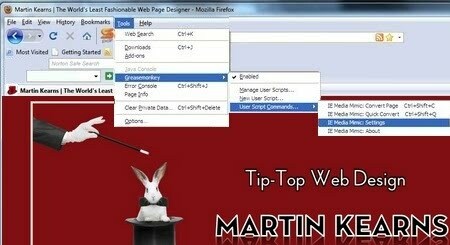 Place your mouse over "User Script Commands". You will now see a further submenu; the first two options are IE Media Mimic "Convert Page" and "Quick Convert" (both of which do broadly the same thing - make Firefox mimic Internet Explorer in terms of the manner in which the current page renders audio streams, duh). These two options are only for those people who might wish Firefox to selectively mimic Internet Explorer. See that empty field against the option to "Convert Pages Automatically"? Tempting, isn't it? So ensure to place your best tick within that box, and don't forget to use the button at the foot of the window asking you to save your changes! Firefox will not only continue to beat Internet Exploder in every department; sleeker, slimmer, faster, and way less likely to fall on its arse like a midnight drunk; it will now sound great, too. You just need to visit a great webpage with embedded sound!